Japan around the beginning of the Heian Period (794-1192). It took root in Japan and was called by many different names such as "Katami-gusa (memory flower)" and "Chigiri-gusa (promise flower)." 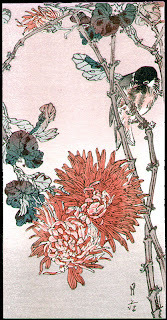 In the Edo Period (1603-1868), there were several hundred varieties of chrysanthe- mum in Japan. 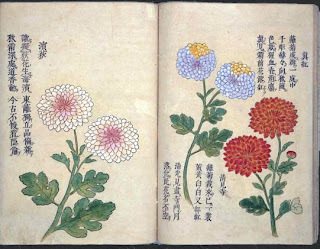 Gakiku is a picture book dating from 1519 and published in this form in 1691, which introduces one hundred kinds of chrysanthemums with beautiful illustrations. The flower's name and a Chinese-style poem is also written for each of the flowers. The preface was written in 1519 by Eikin (1447-1537), a priest of the Rin'zai Zen Sect in Japan, which says that the pictures were the work of Junpo (1504-1549), the second son of a feudal lord of that time. We can also find the postface and the imprint at the end of this book, from which we learn that the book was published in 1691, and that the Chinese-style poems and the postface were added in that year. Gakiku is the first picture book of chry- santhe- mums produced in Japan, possibly modeled on the Kikufu Hyakueizu, a translation of a Chinese book of the same kind published in 1686. The writing and lines are wood-block printed in black, and the illustrations are hand-painted in yellow, white, red, purple etc. 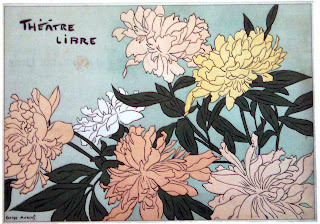 according to the colors of the flowers. The book was once owned by Yokoyama Shigeru (1896-1980), a scholar of Japanese literature. 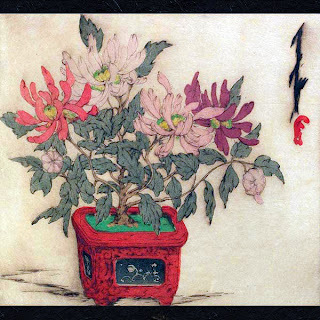 Following the publication of Gakiku, books on chrysanthemum cultivation were published one after another. There was a chrysanthemum boom and chrysanthemum shows were held in Kyoto every year. 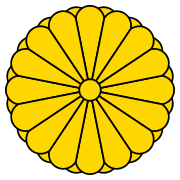 In the middle of the 18th century, the Kikukyo, a learned work on chrysanthemums, was written by Matsudaira Yorihiro (1702-1763), a feudal lord of Mutsu-Moriyama (now part of Fukushima prefecture, located to the north of Tokyo). In the first half of the 19th century, chrysanthemum craftwork became popular in the Komagome and Sugamo area of Edo (now part of Tokyo), and later on, at the end of the Edo Period, chrysanthemum dolls in Dango-zaka (now Bunkyo ward of Tokyo) became an attraction in autumn. (Digital images of all the pages of Gakiku are available here. Thank you for your continued beautiful blog offerings. The old prints are just stunning. thank you so much, dorian. i appreciate y our visit and your comment. I am touched beyond words at this dazzling post. It is the most beautiful that I have read on the internet. 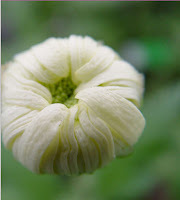 It gave me the idea of making a little chrysanthemum journal of my own from the photos that I have taken. I wish that I read Chinese and could read the manuscripts you referred to. I haven't gotten the video to play yet and am working on that. Leaving a trail of white camelia blossoms behind, for her friend lotusgreen, the ghostly Princess Haiku slips away. I was able to play the video after downloading some software and it's amazing. Next year I am going to grow some chrysanthemums of my own. I just discovered the book too. Where on earth did you find it? What a treasure. i am so delighted at your response--you should see the big grin on my face. glad you got the video to work. thanks again for alerting me to that show. the book is part of the vast national diet library in japan. i always have to refind my way there, sort of just by clicking everything that looks like a link, the bibliodyssey method. your mum notebook sounds like such a terrific idea, kind of like how clothing designers keep a notebook of swatches. maybe you can read a bunch of old chinese poem translations (arthur whaley?) then write some "chinese-like poems" too!